Capcom’s Yoshinori Ono has gotten his hands on a Wii U dev kit and seems to be quite happy with everything it has to offer. In a recent interview, he specifically reassured us that there is lots more to see than what Nintendo showed us last E3 and at CES. What we saw last E3 is not a reflection of everything this console is able to offer. We have been trying development kits and some of its new characteristics will improve its possibilities. It isn’t something like Kinect or other similar accessories, it’s something different. Wii U will be a console with so many and unique possibilities that it will be different to show them in the box they are going to sell… or by magazines or other mediums. 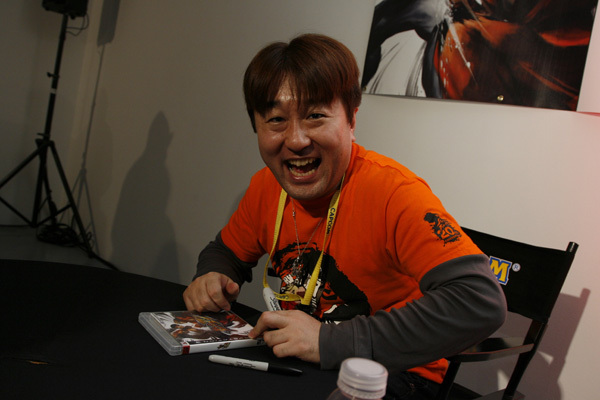 Previously, Ono has commented on the possibility of Street Fighter X Tekken coming to the Wii U. Could that be what he’s working on with his dev kit? uShop, apps, e-boook, lots of multitasking features and swapnote. MONSTER HUNTER 4 WII U!!! “I can’t tell you more about it because, if I do, Nintendo will send assassins to finish me.” – He probably wasn’t joking as a red dot laser suddenly appeared on his forehead. Street Fighter x Tekken on WiiU? Yes Please!! I dunno if I’d get the Wii U version of Street Fighter x Tekken… The PS3/Vita versions has some great exclusive characters, so unless the Wii U version gets some that are even better, I probably won’t be picking it up.